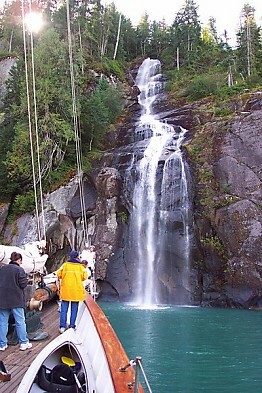 Zodiac is the largest working schooner on the West Coast, and is listed on the National Register of Historic Places. A truly lovely two-masted, gaff-rigged, wooden-hulled schooner, she flys some 7,000 square feet of sails. Zodiac shows gleaming brightwork, polished brass fittings, and classic wood paneled joinery of mahogany, teak and oak. Her mainmast towers 127 feet above spacious decks. She was designed by William Hand, Jr., one of the most prolific American yacht designers of the 20th century. 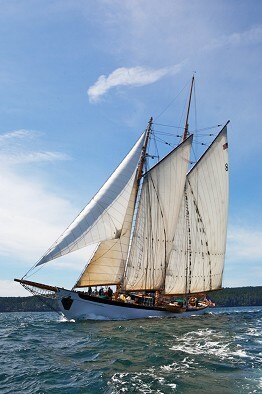 Built in 1924 in East Boothbay, Maine at the Hodgdon Brothers Shipyard, as a luxury yacht, she has sailed to the Arctic, competed in the 1928 Transatlantic Race, and was owned and operated by the San Francisco Bar Pilots from 1931 until her retirement in 1972. She has been lovingly restored to her former glory, and now sails the sheltered Pacific Northwest waters of Puget Sound, the San Juan Islands, and British Columbia's Inside Passage. Zodiac is engaged in youth sail training, maritime internships, charter voyages, and a few scheduled voyages available to the public. Coast Guard certified, and compliant with the international SOLAS standard, Zodiac is equipped with a 450 HP diesel auxiliary engine, modern navigation, communications and safety equipment, and sails with a licensed captain, first mate and experienced crew.